New Winter 2018: A rare find in fully 3-dimensional detail executing a perfect drive or approach to the center of the green, this lifelike lady golfer is a popular choice to build unity for the whole team. 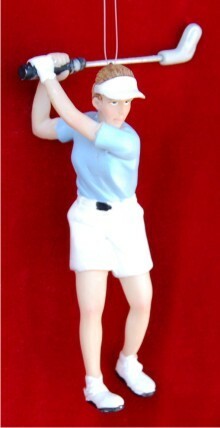 The female golfer perfect swing personalized Christmas ornament is also a great gift for the special player in your life, whether a child, sister or friend. These golf ornaments personalized for each recipient arrive with her name artistically written in a pretty font to create a keepsake that is one of a kind. Ideal for competitive players and casual golfers you hit the links with, the female golfer personalized Christmas ornament makes a cherished gift in our exclusive velvet drawstring pouch. 4 stars Dec 5, 2014 Justin L.